Google has introduced a video meeting product, which integrates Google+ Hangouts and Google Apps with high-definition video-conferencing. While people can already use Google Hangouts and Google+ on their smartphones, tablets and laptops for video-conferencing, the Chromebox for meeting product is designed for meeting rooms and is positioned to compete with Microsoft Lync, which can be used to deliver Skype to meeting rooms. The $999 unit includes a licence for 15 users, along with 24/7 support. It uses an Intel i7-powered Asus Chromebox, a high-definition camera, a combined microphone and speaker unit, and a remote control. The first Chromebox for meeting is a device from Asus, with offerings from HP and Dell to be available in the coming months, he said. “Later this year, we plan to launch in Australia, Canada, France, Japan, New Zealand, Spain and the UK,” said Sengupta. 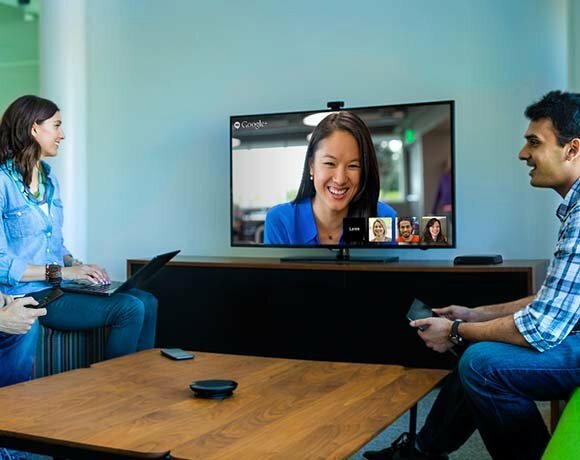 Google said the system can also connect to rooms that have traditional video-conferencing systems using a tool from Vidyo, and participants who prefer phones can join meetings with a conference call number via UberConference. Evenbrite Yelp, Costco and Premier Foods are among the early adopters.